Compound150 says it is a spinoff of T2MoneyKlub, while targeting "compounding lovers" like a sandwich joint targets lovers of cheeseburgers. The ink was barely dry on the most recent civil judgments for millions of dollars against serial HYIP pitchman Matthew J. Gagnon when Compound150 launched yesterday. On Tuesday, the SEC announced $4.2 million in new court-ordered assessments against Gagnon, who’d earlier been hit with more than $2.5 million in assessments in a related case and became the subject of a criminal complaint filed by the U.S. Secret Service. Gagnon was a web-based pitchman for the Legisi HYIP Ponzi scheme and other high-yield “opportunities,” including a “program” in which his alleged partner was a twice-convicted felon. The SEC essentially charged Gagnon with turning a blind eye to obvious fraud schemes — repeatedly. Apparently not taking the clue that HYIP promoters are at risk of both civil and criminal prosecution, the operators of JSS Tripler 2 have launched the Compound150 feeder scam, a companion to the original JSS Tripler 2 scam. After suspending member payouts in December 2011 amid reports of an AlertPay freeze, JSS Tripler 2 — also known as T2 — gave itself a new name: T2MoneyKlub. The addition of the Compound150 scam means that the entity — purportedly operated by “Dave” from locales ranging from Britain to Cambodia to Thailand — means that the original JSS Tripler 2 entity now has a third entry in its scam lineup. But the strangeness does not end there: Indeed, JSS Tripler 2 reportedly based its original name on JSS Tripler, a purportedly unrelated “program” whose affiliates became the subjects in January of a probe by CONSOB, the Italian securities regulator. Compound 150 reportedly launched during a period in which “Dave” was building prelaunch buzz while simultaneously battling (or recovering from) a bout with Dengue fever. In the fraud sphere, it is common for “opportunities” to refer to illnesses, server problems or catastrophes such as typhoons. In upholding the 20-year prison sentence of pyramid schemer Seng Tan, the U.S. Court of Appeals last month pointed out that Tan — who targeted the scam she ran with her husband at Cambodian émigrés in the United States — blamed the scam’s inability to make payouts on Hurricane Katrina. Tan’s husband — James Bunchan — ultimately received sentences totaling 60 years because he discussed murdering witnesses and the federal prosecutor who brought the case. How strange could the JSS Tripler2/T2MoneyKlub/Compound150 “opportunity” get? The answer, perhaps, is that the sky is the limit. 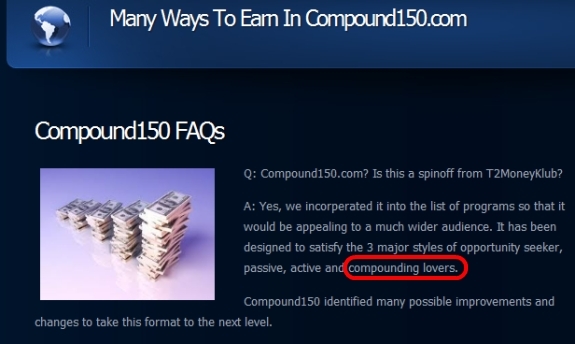 Perhaps positioning itself as a category creator, Compound150 says “compounding lovers” are among its target audience. Compound150 opened its doors amid a weekend flap at the MoneyMakerGroup Ponzi forum in which “Dave” — posting as Peakr8 — protested the forum’s description that the emerging opportunity was an HYIP, not an MLM opportunity. “So are we a HYIP?” Dave asked. In effect, Compound 150 is advertising a (precompounding) annualized return of 365 percent, about the same purported ROI that led to the 2010 indictment of AdSurfDaily President Andy Bowdoin amid allegations he was operating an international Ponzi scheme. If convicted on all counts in his September 2012 Ponzi trial, Bowdoin, 77, faces up to 125 years in federal prison and fines in the millions of dollars. As part of the ASD Ponzi investigation, the U.S. Secret Service seized the bank accounts of some individual ASD promoters. Ten of Bowdoin’s personal bank accounts were seized — and five bank accounts allegedly involved in the operation of Golden Panda Ad Builder, a companion autosurf, were seized. “Dave” was joined in his protest by JSS Tripler2/T2MoneyKlub/Compound150 shill “lolalola,” who insisted that Compound150 was an MLM. In the civil portion of the ASD case, ASD also insisted it was an MLM. A federal judge was unmoved, ordering the forfeiture of more than $80 million, including more than $65.8 million from Bowdoin’s personal bank accounts. Compound150 appears to have a confluence of payout schemes very similar to the schemes that led to at least FOUR ASD-related forfeiture actions, the filing of a racketeering (RICO) lawsuit against Bowdoin, the seizure of tens of millions of dollars, millions of dollars in ASD-related civil judgments — and the ultimate filing of wire fraud and securities- fraud charges against Bowdoin. Bowdoin also was charged with selling unregistered securities. Like Bowdoin, Seng Tan also insisted her “opportunity” was an MLM. The script doesn’t change. The FAQs are taken in at least part from another obvious ponzi scheme Megawealth Investment Network (megawealthmin). MIN is registered to someone from Port Harcourt, Nigeria. Compound150 has an anonymous registration, so the operator could be anywhere. I seem to remember Colon End Parenthesis had one or two “feeder funds”. Tony H: The script doesn’t change. The FAQs are taken in at least part from another obvious ponzi scheme Megawealth Investment Network (megawealthmin). MIN is registered to someone from Port Harcourt, Nigeria. Tony H: I seem to remember Colon End Parenthesis had one or two “feeder funds”. Among the allegations in the CEP case was that it had plowed money into 26 HYIP/autosurf scams — in effect, using offsite “opportunities” to feed the CEP Ponzi. CEP also purportedly had its own in-house payment processor and a plan to use real estate as a feeding venture. Of course, ASD created its own in-house feeders: LaFuenteDinero and Golden Panda. Bowdoin, though, eventually tried to distance himself from Golden Panda after it had been revealed that Golden Panda President Clarence Busby had been implicated by the SEC in THREE prime-bank schemes and was on the receiving end of a permanent injunction. You’ll recall, Tony, that GP allegedly was hatched on a Georgia fishing lake by Bowdoin/Busby in April 2008 — and that Bowdoin made a mysterious trip to Panama and Costa Rica shortly after that trip, according to the allegations. Not long after he returned from Costa Rica, he allegedly ventured to Washington, D.C., to get his purported “medal” for business acumen from the President of the United States. The Secret Service began rounding up the ASD/GP funds a short time after Bowdoin’s alleged Washington trip. “Sure… A ponzi scheme is illegal in most countries. It relies solely on paying out members with the system cash brought in from other members. A bit like robbing Peter to pay Paul. Ponzis do not have any other source of income, and always break down once they can’t cover payouts any longer, but more often than enough, the admins will run off with the cash as soon as they see it starting to stall. LOL, harkens back to the days of Nick Smirnow and the ,”we are not a HYIP, we don’t believe in them” nonsense…! The flap over C150 being in the hyip folder seems to be that it doesn’t have enough traffic to stay at the top of the classification, and Dave is too cheap to buy a sticky…! laidback: The flap over C150 being in the hyip folder seems to be that it doesn’t have enough traffic to stay at the top of the classification, and Dave is too cheap to buy a sticky…! Fair to say that many of the 2400 active T2 members see the feeder program for what it is and are not joining or are joining and just making the minimum deposit…. This ponzi has begun to implode…..Only thing left of interest now is see what Dave comes up with as an “exit stratergy”….